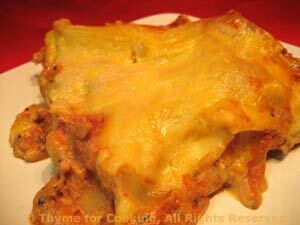 Salmon Lasagne, made with poached and smoked salmon, a gourmet main course. Hard to imagine salmon in lasagne? The creamy Béchamel sauce goes perfectly with the fish, and there's just enough tomato sauce to add the right 'lasagne' element. This makes enough for 2 meals (or 4 persons). Warning: this is decadent.... but delicious! Put the salmon in a non-stick skillet just large enough to hold it. Add water to just barely cover. Cover the pan, put on medium heat and poach until done - should take 10 - 15 minutes. Heat the oil in a medium saucepan over medium heat. Add onions and garlic and sauté for 5 minutes or until tender. Add smoked salmon and sauté briefly. Add crushed tomatoes, tomato sauce, herbs and red wine. Cover, reduce heat and let simmer until needed. In another medium saucepan heat the butter over low heat. When all of the milk is in bring to a boil (should almost be there), whisking. Then remove from heat. Congratulations! You have just made a béchamel sauce! Allow to cool for 5 minutes then stir in cheese. Remove salmon from poaching liquid, skin if necessary and break up into flakes. Remove tomato sauce from heat and add salmon and yogurt. Cover and bake 400F (200C) for 30 minutes, or until noodles are done. Test in center with a sharp knife. Uncover and bake 5 minutes longer to brown cheese. Remove and let rest for 5 minutes. Cut into squares (or oblongs) and serve.